A deep look at the market for books on programming languages. In this fourth post (see posts one, two and three) on the State of the Computer Book Market, we will look at programming languages and drill in a little on each language area. 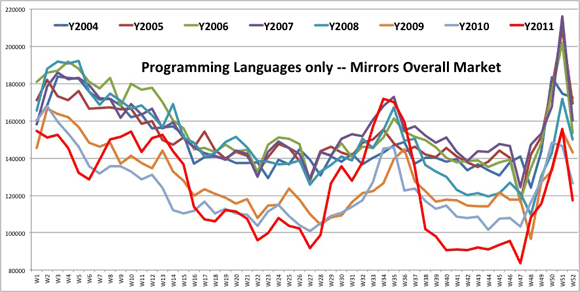 Overall, the market for programming languages was up slightly at 1.15% in 2011 when compared with 2010. There were 6,435,247 units sold in 2011 versus 6,361,178 units sold in 2010, which is an increase of 74,069 additional units. Java was the biggest language again and experienced healthy growth of 13.46% or 33,930 more units in 2011 than 2010, while PHP occupied the opposite end with the biggest decrease at -26,994 fewer units year-over-year or a -22.50% rate of change. Before we begin to drill in on the languages, we thought it would be best to explain our “language dimension.” When we group books by their language dimension, we categorize them by the language used in their code examples. So Flash Programming with Java would be in our Flash atomic category, but the language dimension would be Java. Similarly, our Head First Design Patterns book contains examples written in Java, so it too carries the “Java” tag on the language dimension. To provide some perspective, 2010 and 2011 have been a mixed-bag of results for tech publishing, meaning there were some bright spots with some of the technologies and some definite low areas too. The chart directly below does not include books that are method-oriented, about project management, about consumer operating systems, or books without language-oriented material. So this is a different view of the market than the overall view found in post 1 of this series. You can see all languages on a week-by-week basis while showing that the the languages closely mirrored the overall market found in post 1. 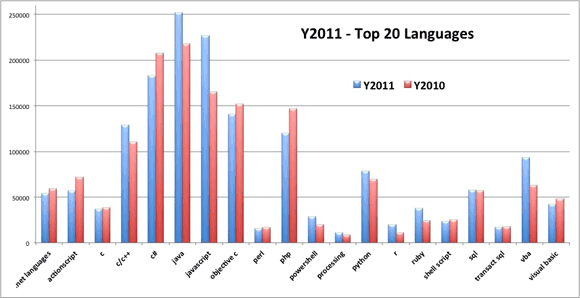 In other words, the graph for Languages shows that 2011 was a roller-coaster for languages too. If you look at the chart below, you will see which languages were responsible for the most units sold between 2004 and 2011. The chart is basically the sum of units each year for the respective language. The top ten languages generated unit sales of 10,283,109 for the 8-year period, while the second ten generated 2,910,636 in the same period. The top ten languages represented roughly 72% of units sold during this period. With so many languages to choose from, makes me wonder if any language will every see the numbers that Java experienced in the early 2000 timeframe. 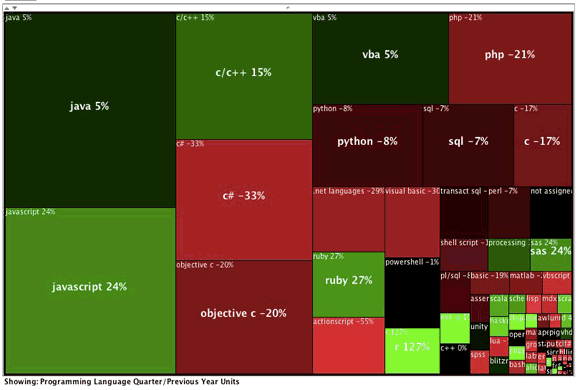 In the treemap view above, which compares the last quarter of 2011 with the last quarter of 2010, you’ll notice balance of green, red and black areas. This pretty much indicates that the last quarter of 2011 was roughly the same as the last quarter of 2010 from the programming languages perspective. Most of the bright green, which indicates rapid growth, is in the bottom right hand corner and small in size. This means there was some growth with small languages in the fourth quarter of 2011. Before we dive in, let’s look at the high-level picture for the grouping of languages. I have grouped these languages by total number of units sold between 2004-2011. As you can see in the table below, the Large and Major languages were up collectively, and everything from Mid-Major and below was down. However books where the language was the focus, ended up 74,688 ahead of 2010 even though the Mid-Major and below lost -15,120 units compared to last year. You’ll notice in the Major languages that Ruby had the biggest growth among this grouping. And the R language had significant growth and surpassed Perl in sales units. Perl used to be one of the largest languages around and is now ranked #19 among the languages. PowerShell experienced it second consecutive year of growth in 2011. Here are the top titles for the Major languages. The news in this set of languages is that 3 of the 11 languages saw growth in 2011 so the grouping as a whole is off by about 18.35%. This is partially due to a couple of the languages moving up to the prior category &#151 most notably R and SAS.. Here are the top titles for the Mid-Major languages. The news in this category is the growth of functional languages, like Scheme, Scala, Haskell, Alice and Lisp. These languages showed a nice 51.38% growth in 2010 and another 11.17% growth in 2011. Here are the top titles for the Mid-Minor languages. No Starch Press Land of Lisp: Learn to Program in Lisp, One Game at a Time! This category of languages saw 4 of the 7 languages sell more units in 2011. There was roughly a 1.91% increase in units sold year-over-year. The biggest gains were Puppet and Stata. Even if there was only one book per language in this grouping, it would be hard to financially justify a print product because of economies of scale; unless of course the publisher of a title is selling lots of copies direct on their website or direct to corporations or colleges. The combination of digital and print may help some of the titles below this point actually make more financial sense. My experience says anything below this point is not financially beneficial to the publisher or author, yet there may be other reasons they are in print. Here are the top titles for the Minor languages. d, erlang, opencl c, applescript, mathematica, latex, tcl, jscript, minitab, apex, autolisp, pure data, fbml, hla, peoplecode, opengl shader, spin, fortran, pig, silverlight, mel, sparql, kml, linden script, lingo, coffeescript, sml, cobol. abap, blitz3d, octave, nxt, gml, pascal, prolog, ml, chef, x++, inform, cfscript, cfml, racket, boo, jcl, siebel escript, idl, javafx, mvpl, m, verilog, jsl, nxc, limbo, mysql spl, rexx, rpg. ada, awd, bondi, c/al, cachesql, cl, cs2, delphi, directx, dsl, e, egl, eiffel, go, haxe, maxscript, mumps, natural, ocaml, oopic, opl, pda languages, phrogram, pl/1, q, qbasic, realbasic, s, spark, squeak, windows script, xquery. Next up, post 5 in this series will look at digital sales.